Photos Credit: PSA’s official website. Egypt’s Mohamed El-Shorbagy sealed the 2017 Channel VAS Squash Championships held at St George’s Hill, Surrey in England from October 18 to October 22, 2017. 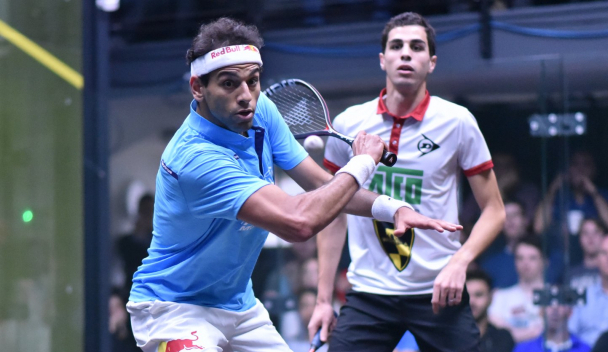 Mohamed El-Shorbagy, Marwan El-Shorbagy, Fares Dessouky, Mohamed Abouelghar, Tarek Momen and Ali Farag are the six Egyptians players who competed at the 2017 Channel VAS Squash Championships. It was an all Egyptian final which lasted for 61 minutes and took place between El-Shorbagy, ranked third internationally, and Ali Farag, ranked the fifth. Farag won the first game by 11-6. And then, El-Shorbagy won the three following games by 11-9, 11-5, and 12-10. Thus, the match ended 3-1 in El-Shorbagy’s favour. It did not take long for El-Shorabgy and Farag to meet in a world championship’s final. On October 14. 2017, both met in the US Open Squash’s final which took place in the US. Victory was for Farag who won the final by 3-0 (12-10/11-9/11-8). Both squash players Ali Farag and Nour Al-Tayeb won the 2017 U.S. Open Squash Championships making them the first married couple to seal the championship on the same night.